Reverend Martin Luther King, Jr. said the most segregated hour in the United States occurs on Sunday morning. Based on my experience in visiting more than 52 churches his assessment is still painfully true. We need more diversity in our churches. I long to attend a diverse church, one with racial diversity, ethnic diversity, socioeconomic diversity, and even political diversity. Oh, and one more, I desire a church with theological diversity. What a messy, beautiful place that would be. But until we embrace diversity in how we view God, we have little chance of realizing these other types of diversities. Diversity starts with God, but we’re not doing our part. Instead we congregate ourselves with people who see God exactly as we do, who practice faith in the same manner and think our particular brand of Christianity is the best. We assume we are right, and everyone else is wrong. We may not say this with words, but we show it through our actions. This puts a narrow view on Christianity, whose worldwide adherents number around two billion. As a result we go to church with people who look, think, and act like us. And if someone doesn’t fit our mold we kick them out, either directly or indirectly. We tell them to leave or suggest they “might be more comfortable at a different church” – when really it’s our comfort we are most concerned with. Other churches aren’t so forward. There the act of exclusion occurs with subtle effectiveness. We simply ignore those who hold different understandings of God, how we worship him, and our role as his followers in the world. We give them a smug, holier-than-thou shunning. Instead we need to embrace our differences in belief; we need to seek theological diversity. Not everyone practices his or her faith in the same manner, and not everyone worships God as we do at our church. Not everyone sees the same things when they read the Bible. 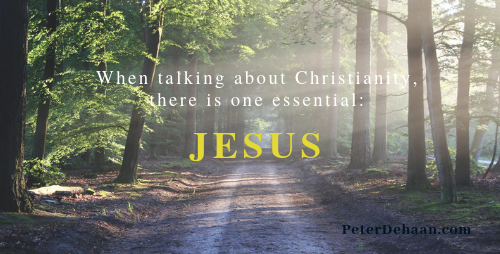 If we are talking about Christianity, there is one essential: Jesus. Everything else is secondary. The way we worship God doesn’t matter. The songs we sing, the instruments we play, the clothes we wear, the version of the Bible we read, and the way we pray aren’t relevant. How we interact with the world, view baptism, interpret the end times, comprehend the Holy Spirit, and practice communion doesn’t matter. In our faith essentials nothing should truly matter except for Jesus. After all, Jesus is the Christ and we put his title in our name when we call ourselves Christians. Now we just need to act like Christians, people who follow Jesus. But until we embrace our theological differences we will never achieve any significant degree of diversity, not racially, ethnically, socioeconomically, or politically. Until we become theologically diverse we will remain segregated on Sunday morning. What are your experiences with diversity? How diverse is your church?